Chavda Hotel Zanzibar is a small, well-maintained bed and breakfast hotel in the heart of Stone Town, Zanzibar and in close proximity all the major attractions and activities. At Chavda, you can be ascertained to encounter smiles and personalized service throughout your stay,which further adds to the homely feeling the hotel prides itself of. The hotel has more than 40 rooms spread over three floors. There’s a new bar situated on the rooftop where you can soak up ocean views over the tin rooftops of Stone Town while you enjoy sundowners. Breakfast is served in the restaurant a floor down. The hotel is clean and comfortable, the en-suite bedrooms are decorated simply with Zanzibari furniture. There's a four-poster bed, side table and cupboard. One finds all the modern conveniences - air conditioner, mini-bar fridge, safe and satellite tv. 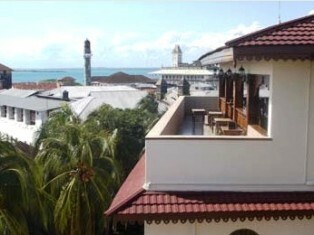 The Roof Top Restaurant and Bar is a unique spot having a panoramic view of Stone Town, the Ocean and the adjoin islets of Zanzibar. It caters for varieties of mouth watering cuisines such as the Indian Cuisine and Tandoor, Chinese Cuisine, Continental dishes, and local Zanzibar dishes. A romantic candle-light dinner at night can be arranged which make the guest feel the true magic of this place when the moonlight reflects on the gentle waves of the Indian Ocean. From time to time the hotel also arranges barbecues on the beach.